The United Kingdom called for a special OPCW session in late May, stressing the need to uphold the global ban on chemical weapons. The intergovernmental organization's main goal upon creation was to promote and verify adherence to the Chemical Weapons Convention. Moscow will not recognize the Wednesday vote, considering it "a heavy blow to the convention and to the OPCW," Russian Deputy Foreign Minister Sergei Ryabkov said Thursday. 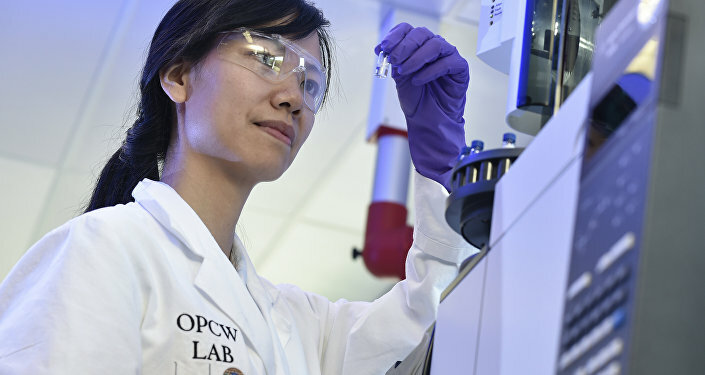 The UK- and US-backed acquisition of new powers threatens to undermine OPCW credibility and transform it into a political tool, Swiss lawmaker Emmanuel Kilchenmann told Sputnik. "Those neutral organizations should not be used as a tool of politics. We see exactly the intentions behind this proposal of the United States and the United Kingdom. These allies all the time try to use some institutions to make them stronger in efforts to give more credibility to their allegations. They should remain neutral, objective and not to be a tool of politics," Kilchenmann said. The lawmaker described the UK-proposed draft as an "attack on their [OPCW's] checks and balances system" and on its credibility. Russia's envoy to the OPCW Alexander Shulgin said the atmosphere at Wednesday's session was tense and alluded to attempts to blackmail Russia's closest allies into supporting the resolution. Despite these efforts, China, India, and South Africa backed Russia in rejecting the motion. In the run-up to the vote, Shulgin stressed that Russia's position was that the UN Security Council was the only organization that can pronounce someone guilty of chemical weapons use and impose sanctions. The special session was called in the wake of an alleged chemical weapons attack in the city of Duma near Damascus in April. The Syrian government strongly denied carrying out any such attack, but the United Kingdom, France, and the United States launched dozens of missiles at what they said were chemical weapons facilities used by Damascus. The Russian delegation to the OPCW has criticized the organization's methods of investigating the incident and unsubstantiated conclusions. Western states are already using the "chemical weapons" allegations against the Syrian government, so their latest move is to create a more convenient solution to continue doing it, Tarek Ahmad, a representative of the Syrian Social Nationalist Party (SSNP), told Sputnik. "The chemical weapons issue is one of the weapons in the hands of the Western states against Syria. It is an easy tool to put the blame on anyone. The western allies tries to create a new more comfortable mechanism that will give more credibility to their unfounded allegations," Ahmad said. Mais Krydee, a representative of the Syrian Democratic Front, believes that the new powers of the OPCW are part of a general strategy to put additional pressure on Russia and Syria. "This is a political game aimed at pressure on the Russian and the Syrian governments. It is made by those who want to interfere in Syria, they need any occasion," Krydee told Sputnik. The head of the Russian delegation at the OPCW special session said the organization appeared split and its members pondered the future of the OPCW after the approval of the motion.